WELCOME! I have been a collector of Berenstain Bears books and memorabilia for nearly 30 years. My collection began like so many of you — as a young child, I treasured the Berenstain Bears books and this love of their stories and illustrations did not fade as I entered adulthood. My collection grew significantly in the late 1990s and early 2000s when online auction sites like eBay made the acquisition of hard-to-find items much easier. What was a collection of Berenstain Bears books soon grew to include puzzles, games, figurines, plush toys, posters, video games and software, VHS tapes and DVDs, and much more. Today my Berenstain Bears collection is the largest known, comprising thousands of unique items. In addition to officially licensed Berenstain Bears books and memorabilia, I also collect other books and drawings by Stan, Jan, Leo, and Mike Berenstain produced outside of the Berenstain Bears franchise. This blog grew out of a personal passion for collecting, but also as a means to help other fans and collectors. While building my collection of the past decades, I found it incredibly difficult to come up with a comprehensive catalog of Berenstain Bears books and memorabilia. 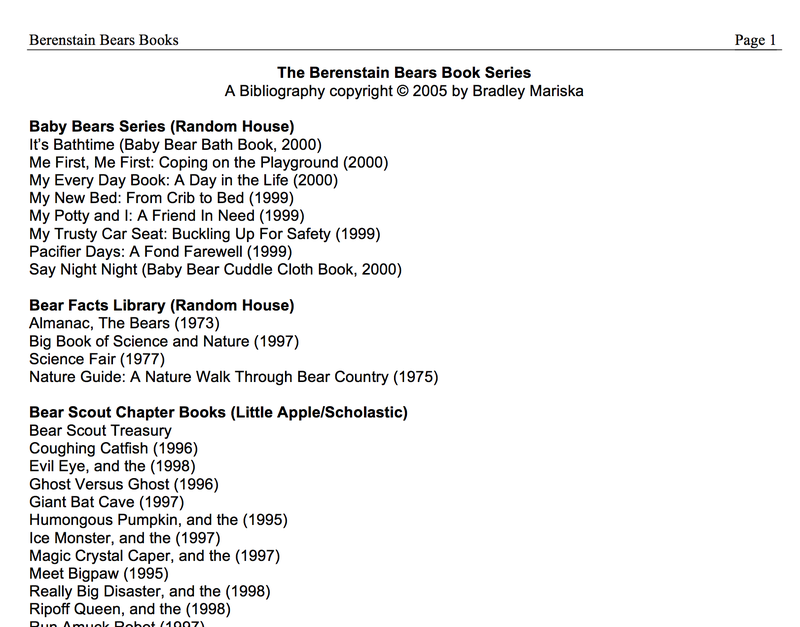 In 2005, I published my first complete Stan and Jan Berenstain / Berenstain Bears Bibliography. While admittedly incomplete, it was far more comprehensive than any other list of Berenstain Bears books, including the official Berenstain Bears bibliography published by BerenstainBears.com. A glimpse at one of the earliest versions of my Berenstain Bears Bibliography, 2005. The list has grown significantly and now reflects a complete list of storybooks, activity books, and ephemera. The current catalog is updated/corrected on a regular basis. My list contained several books that were missing from the official list, as well as an extensive list of coloring/activity books that are not included on many traditional storybook bibliographies. 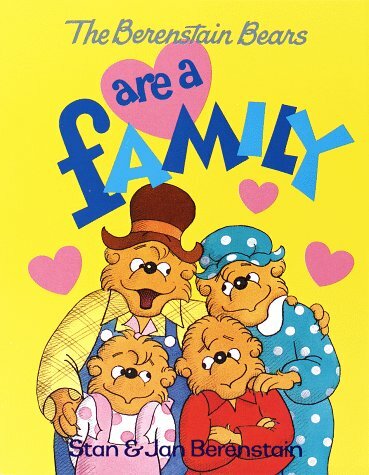 I continued to update my book catalog on an annual basis and the current version now includes more than 700 Berenstain Bears storybooks, activity books, and ephemera, as well as a complete list of non-Bear books published by Stan and Jan Berenstain, Mike Berenstain, and Leo Berenstain. My website is also growing to feature information and complete (as possible) lists of other memorabilia: jigsaw puzzles, board games and activity sets, computer software and video games, and more. Additional categories will be added as time allows. hello! i have a set of the porcelain figurines all in very good shape and i am looking to sell them online. i was wondering how much they are worth. i have -Jumping rope-Hello Grizzly Gran-Rapids Ahead-Nitey Nite, Sleep Tight. Prices vary a lot. Rapids Ahead is probably the most rare ($20 or $25?)…. Jumping Rope, Hello Grizzly Gran, Nitely Nite are probably worth about $10 each…. Antique and Collector shops sell them for more but these show up on eBay a lot so you can’t really ask too much for them. Good luck! Hello Brad. Awesome site! I am going to have this as a theme for my soon-to-be 6 year old who loves Berenstain Bears. We have about 30 books right now, but wanted to buy more for her birthday (and Christmas). Besides Doyleston Bookstore and Christianbook.com, are there any other websites you recommend that offer a large set, at even better pricing? Thank you. If you’re looking to pick up a bunch of Berenstain Bears books for cheap, I would consider buying used lots from eBay. I don’t know of any stores other than Doyleston that offer package pricing. Good luck! Glad you enjoyed the site! Hello, I just stumbled upon your blog while looking for info on a Berenstain Bears wrist watch that i own. I can’t find any info on the internet regarding the watch. Curious if it has any value. Thanks! Hello! I am glad this site exists. Just found it. I have a fairly large handrawn cartoon done by Mr. Berenstain Thanking a local bike shop. The Cartoon depicts a portrait of Papa Bear. It is a little sunbleached but otherwise ok. How would I ascertain value on something like this? Thanks in advance for any help you can provide. It depends a lot upon the subject matter and WHICH Mr. Berenstain you’re referring to (Stan or Mike). I’m SO SORRY I didn’t see this comment until now. My apologies! Hello. Thanks for writing back. It was done by Stan Berenstain and it’s a picture of PAPA bear. Thanksonce again. Ebay, Etsy, and just keep checking. I have a collector friend who spent a couple years trying to find August. Not sure why that one seems to be more rare! Weird! Hello! I have a Connor 1984 Berenstain Bears Home Sweet Tree Puzzle. It is in excellent shape, and I am purging the toys I have and need to sell it. It isn’t chipped and the color is fantastic (I love the blue background) I was wondering if you could point me in the right direction? I would want someone who cares about it to get it. Please let me know! I love those puzzles so much! I would suggest listing it on eBay. When it shows up, I’ll share it with our Berenstain Bears collectors group! I’m sure somebody wants it. I love that puzzle (all of the Connor ones, really). THANK YOU FOR THE COMMENT! I listed it! Please share, like I said I would really like someone who cares to get it!